We were watching an ABC news special about earth's future, and one of the kids in the room bemoaned the fact that at some point we may no longer be able to see polar bears. We'll miss them! But wait--we weren't going to see them anyway. How many people visit the fringe of the arctic, where they live? In the future, we'll still have all the images and videos that we do now. 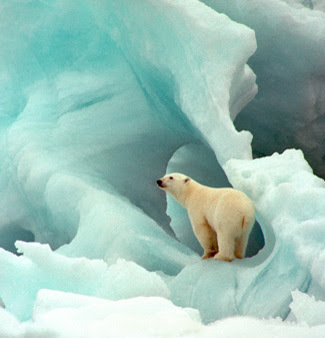 What we'll no longer get to have is a certain thought--that there are polar bears living up there in the arctic. Curiously, that will change the look of pictures like the one above. They'll no longer represent (roughly) polar bears in our world, but a past we can't retrieve. Oddly, what you think while viewing a picture affects the way the picture looks. Rest assured. They'll save a few polar bears and put them in special zoos. Maybe they'll even save a few people from Bangla Desh too. "Oddly, what you think while viewing a picture affects the way the picture looks." Oddly, what you think when you hear a particular word affects what the word means. If the analogy holds then this is not odd, except to the degree that the distinction between signifier and the signified is odd. Right now a picture of a polar bear signifies a creature that lives in the present time, after we finish setting the world on fire with our promethean projects, we will gaze at pictures of polar bears in our underground bunkers and think about the way things used to be. My reaction, hence my ironic comment above, is that whether "we" can see polar bears in the future is not the priority insofar as global warming is concerned. Priorities might be people who are going to be flooded by rising sea levels (Bangladesh) and the well-being of polar bears, but not whether we can see them or not. I'm not making any comment here about what matters most, as far as global warming is concerned. I'm just intrigued by what matters to us, as far as polar bears are concerned. I think it matters to us to be able to see great pictures of polar bears, but that can't be all, since we can go on doing that whether they exist or not. Apparently, we want to be able to go on having the thought that there are polar bears in the wild. We want to experience pictures of polar bears as representing a current reality. Beyond that, I think we want there to BE polar bears in the wild. It's a first class puzzle what makes that good, and what makes it better than having a few specimens in the zoo, or not having any polar bears at all. What makes it good for there to be Polar Bears in the wild? Ask a Polar Bear. It seems like the same question as what makes it good for human beings to survive. Polar Bears being our fellows, so to speak, we see the extinction of Polar Bears as equivalent to the extinction of the human race and the unnecessary death of each Polar Bear as similar to the unnecessary death of each human being. Walk a mile in my shoes. That's why I brought up signifiers and what they signify. Speaking for myself only, with rather brutal honesty, I'm not sure I really care one way or the other about polar bears. I've never seen one, except on TV and in magazines and on the web. They are neat looking, the cubs are cute when they play, their capacity to live in arctic environments is utterly remarkable. I could say I care about polar bears but I think that would be a lie. But I do care about what they symbolize. I do want to look at pictures of polar bears and think: their habitat is secure we didn't melt so much ice that we killed them all, slowing dwindling as they lose their habitat starving and drowning to death. It's not about the polar bears, it's about what it says about US that we seem unable to stop our slow uncertain march towards environmental catastrophe.